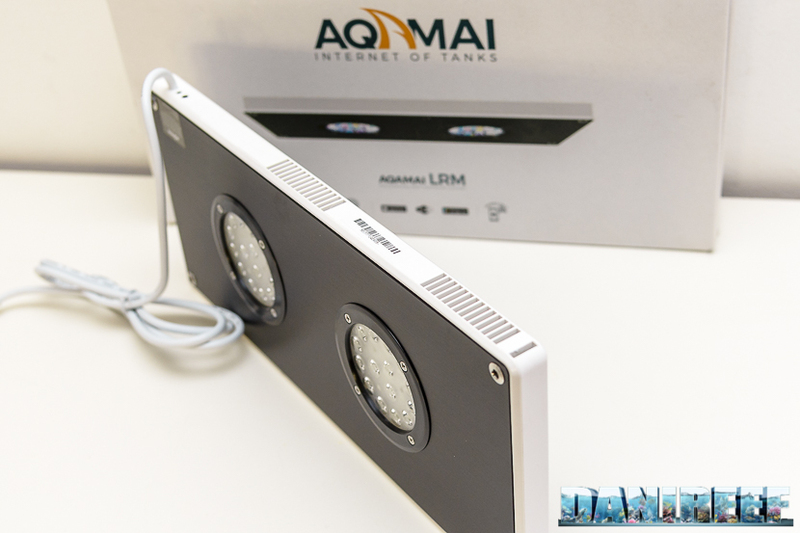 This is the new Italian ceiling light Aqamai LRM, and I have to say, it really impressed us, especially the instrumental data. The ceiling light is very thin, and is black with white sides and a double power cluster. It’s a popular look for ceiling fans today and it’s an especially American aesthetic. 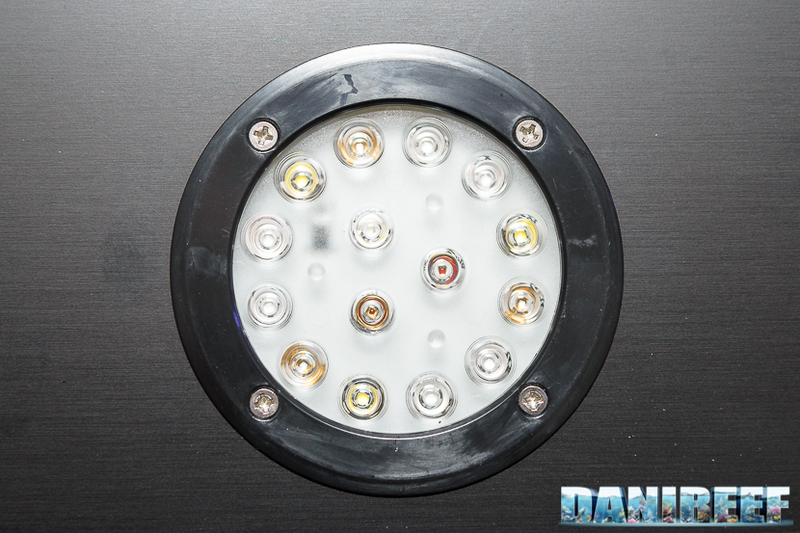 It has 8 LEDs with different colorations, divided into 6 channels. So we have 15 LEDs per cluster. The “cool white” LEDs are very interesting, they’re 6 Nichia NVSW219C , with a CRI > 70 and 180 lumen/watt, a very high value. 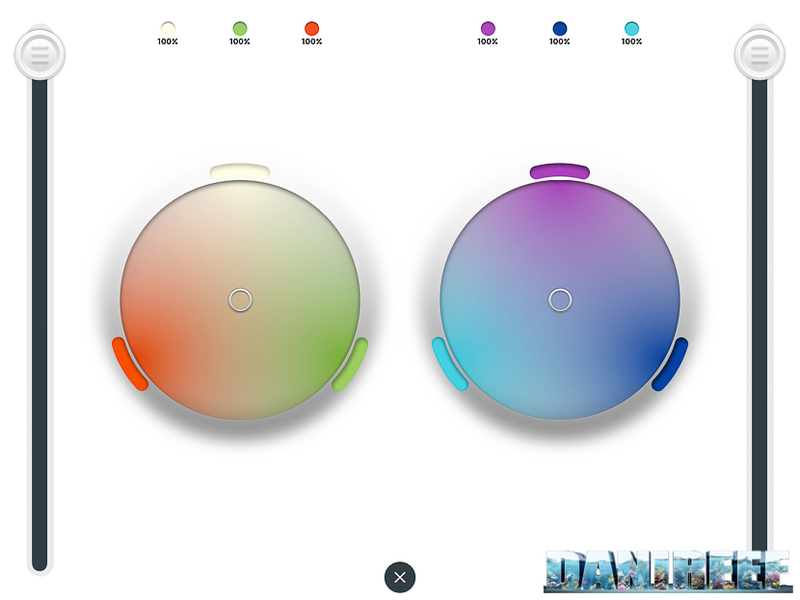 In addition, there are two UV LEDs by SemiLEDs of 405 nm, 4 Indigo SemiLEDs of 415 nm, 6 Royal Blue Nichia NCSC219BT (very beautiful), 6 Blue Nichia NCSB219BT, 2 Green Nichia NCSG219BT, 2 Red-A Nichia NCSR219BT, and finally 2 Red-B OSRAM Oslon SSL. 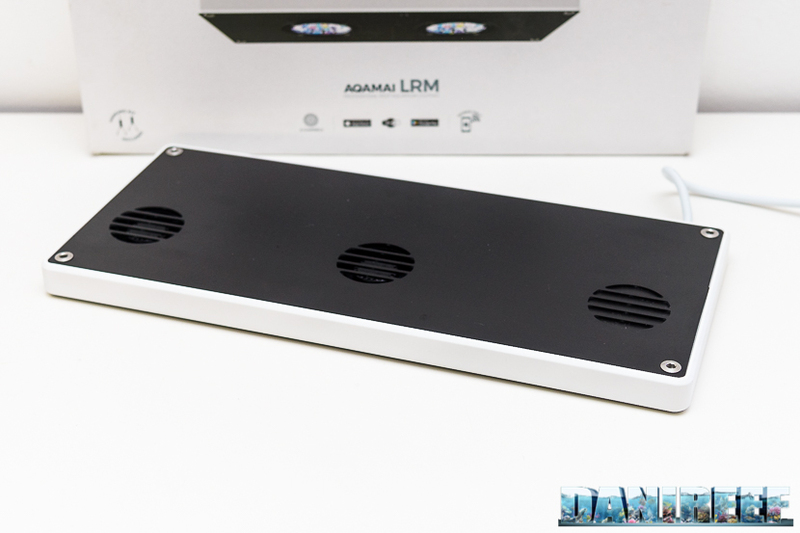 The Aqamai LRM is well constructed, just 2 cm thick, with two cooling vents and two clusters of lights. 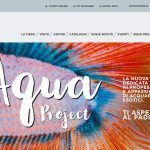 The design is very similar to that of brands such as the American Radion and AquaIllumination. The ceiling light can be ordered with a wireless app, available for Apple or Android. You won’t need anything else, just connect the plug and it will create its own WiFi network. It’s a very straightforward solution, but it penalizes anyone that who doesn’t have either of these two systems. The app works very well, and it’s very easy to use. Above, you can see the the manual command as it appears on iPad, where the two lateral sliders represent the power, and the two circular selectors the color gradation. As usual we used our Seneye Reef probe for the survey, whose software permits the detection of lux, PAR and PUR. We did 5 measurements, all of them in the center of the ceiling light’s cluster. 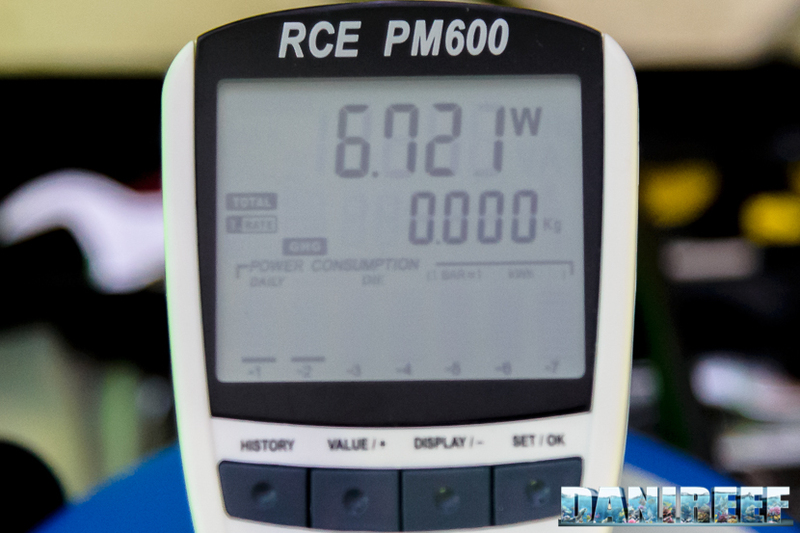 In uniformity with previous measurements, we were 20 cm away from the ceiling light, and in this position we measured the maximum total power expressed, and then the maximum power of the 6 channels individually. And here below you can see the 6 channels individually. We left only one channel 100% turned on and alternated all the channels in turn. It’s easy to notice from the chart that the majority of PAR and LUX is from channels Cyan, Blue, and White, in that order. The other three channels don’t affect much. I’m sure you didn’t notice this thing: if you consider the channels individually, they express much more power than together. Maybe the chosen chip or the power supply can’t bring the LEDs to their maximum, or it’s possible to take power from one channel to give it to another, like AquaIllumination HD. The test of the instant consumption was possible thanks to the very useful tool RCE PM600. The result is already given in watts. 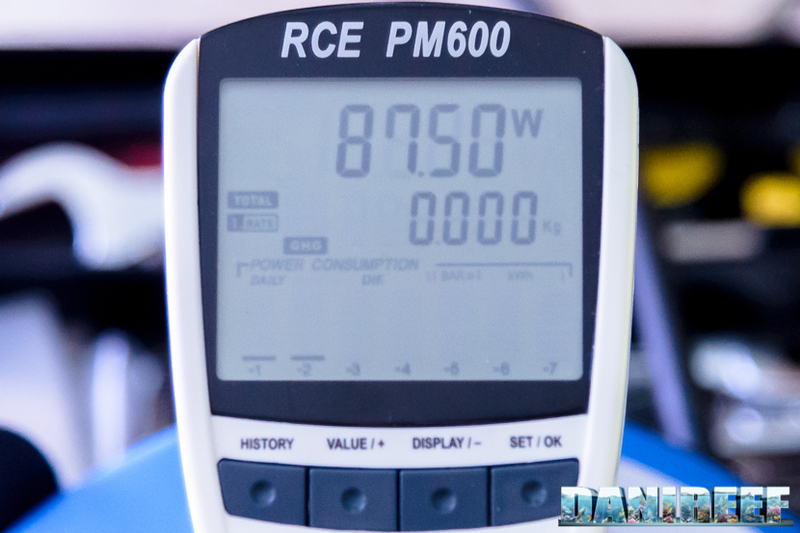 The calculation of the maximum absorbed current, that is the power, is 87.50 watts. 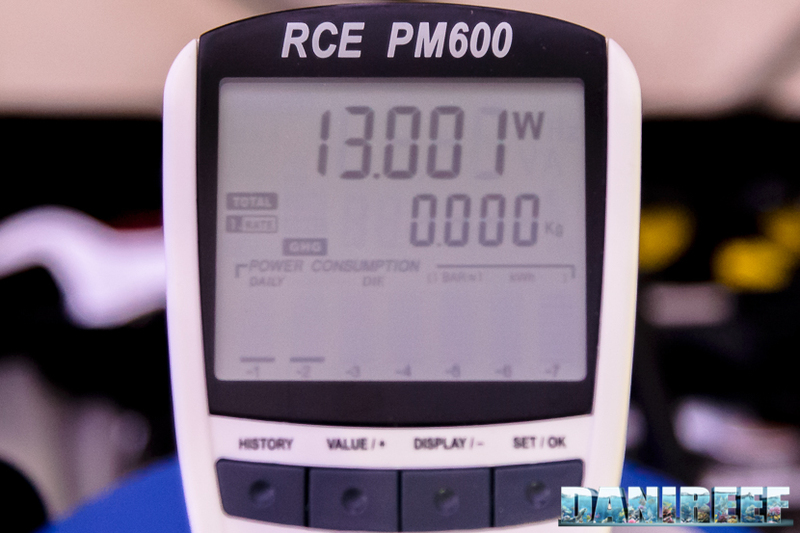 It’s a lower value than the declared one of 100 w (-12.5%), which can be due to a different rotation system of the vents. We’re referring to the measurements we’ve done before about other comparable ceiling lights. 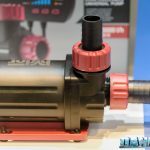 In particular, we can refer to the last Philips CoralCare (article), the GNC 466 (review) and the Maxspect Ethereal (article). 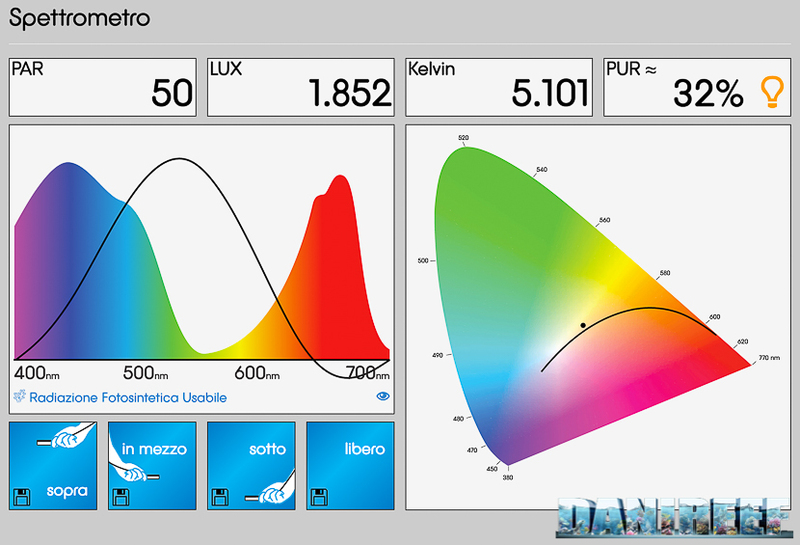 The Philips registered 1,496 PAR and 55,230 Lux, the GNC 696 PAR and 25,697 Lux while the Ethereal 689 PAR and 25,440 Lux. But the most specific comparison can be done with another cluster ceiling light, like the Zetlight UFO (article). It has just one cluster and it registered 791 PAR and 29,193 Lux (consider that Aqamai has two clusters and not one). According to these values we have optimum results for Lux and Watt, but we have to remember that we have a single cluster ceiling light so the comparison needs to be done with equivalent ones, like UFO and Radion. 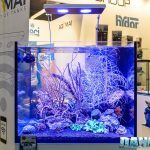 So, it has superior lux per watt than the Philips CoralCare, but its optimal result will be related to a shorter surface. 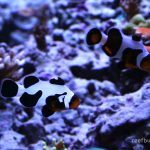 We think the optimal coverage is about a 50×40 cm area for hard corals (SPS). 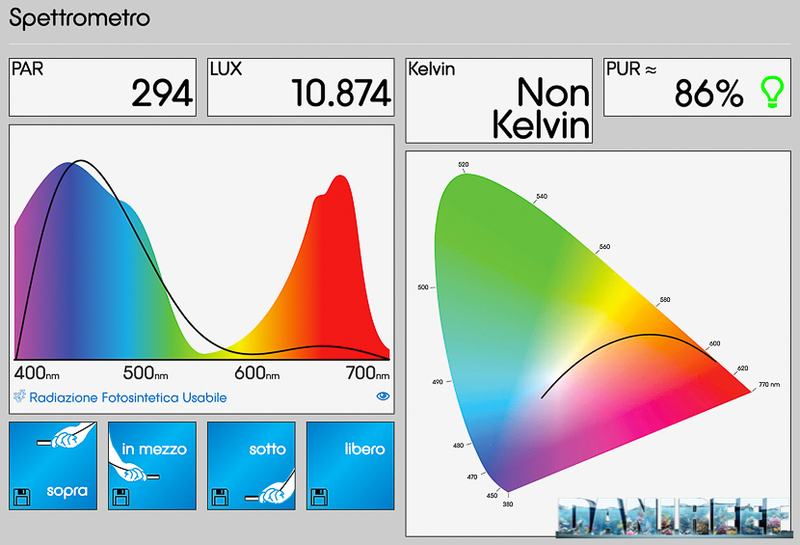 The comparison with a Radion G2 PRO, our review, not on the market anymore, but it’s the most recent Radion we could try, has in the middle of the ceiling light a value of 2,117 PAR, 78,049 Lux and PUR about 72%. In this case the return is almost half. 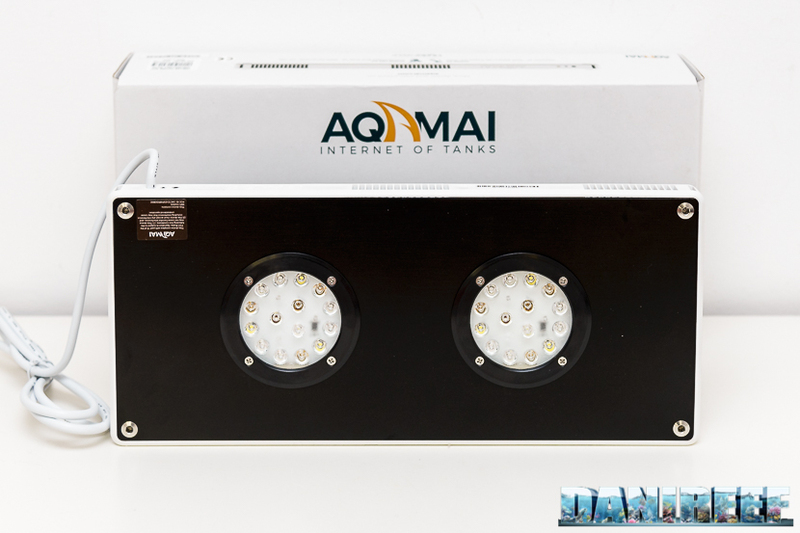 The Aqamai LRM costs 465 euro. 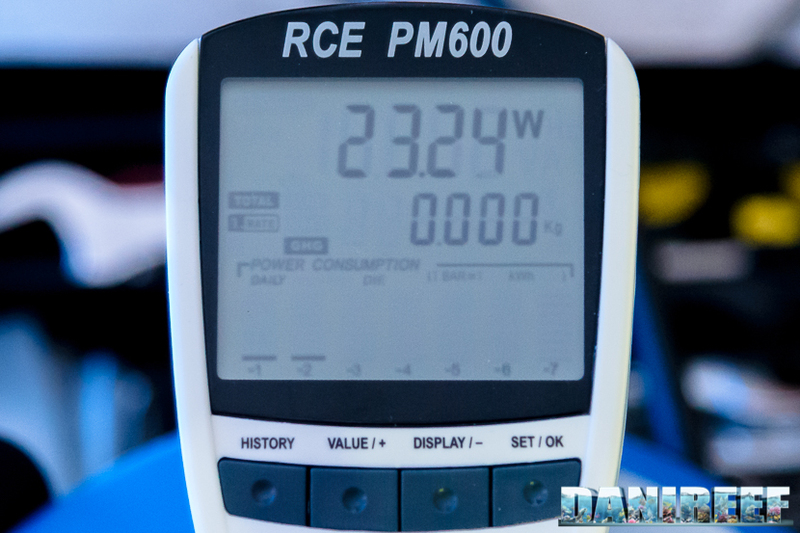 Its absorbed power is 87.5 watt, so it has a cost/watt of about 5.2 euro for each watt. If you take a look at the chart below you can see some comparisons with other ceiling lights we’ve tested.